Remember that time when Intel said it was teaming up with AMD for an 8th Gen Coffee Lake CPU with Vega graphics inside? Well, said processor is just about ready to launch. Announced yesterday at the Consumer Electronics Show (CES), the two Core i7 chips will be arriving this spring, and Intel’s even created two of its very own teeny tiny PCs to show us exactly what they’re capable of. VR on a PC I can just about fit in the palm of my hand? Sign me up. To be precise, both systems are actually NUC PCs. NUC (or Next Unit of Computing) is Intel’s name for its ultra small form factor systems. They’re generally barebones units intended for user customisation after purchase, but previously they’ve been about as useful for high-end gaming as a decade-old netbook. Great for media streaming, but not much else. 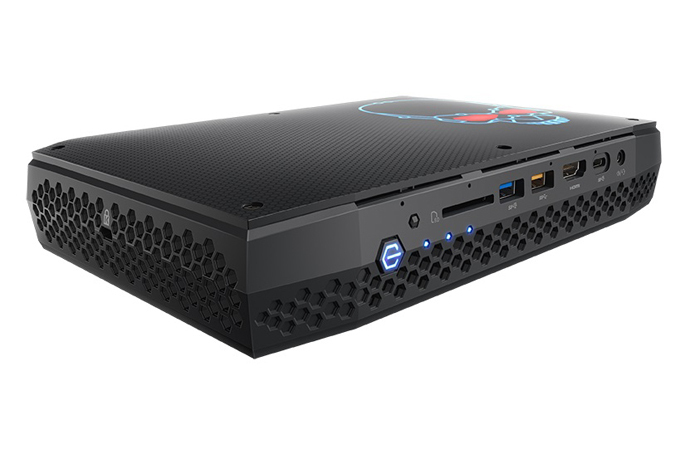 The new, easily-parsable NUC8i7HVK and NUC8i7HNK, however, are the most powerful NUCs Intel’s ever built, and will use its new pair of 8th Gen Core i7 processors with onboard AMD Radeon RX Vega M graphics to strike down the media streamer stereotype once and for all, supercharging the ultra compact PC into a new era of possibilities for gaming. The NUC8i7HVK is the more powerful of the two NUCs and packs an unlocked, quad-core 3.1GHz Intel Core i7-8809G processor and AMD’s Radeon RX Vega M GH graphics. The NUC8i7HNK, meanwhile, comes with a quad-core 3.1GHz i7-8705G processor and Vega M GL graphics. What’s more, both fit in a tiddly 1.2 litre case that measures a mere 221x142x39mm. Each NUC also supports up to 32GB of RAM, and you’ll also find a pair of M.2 slots on its motherboard for adding an NVMe SSD and SDXC card reader post-purchase. In terms of ports, you get two HDMI 2.0a connectors that support 4K at 60Hz and HDR (one of which is usefully found on the front for easy access to VR headsets), two Thunderbolt 3 ports, two Thunderbolt USB-C ports and two mini DisplayPorts. Altogether, that means each NUC will be able to support a whopping six (yes, six) independent monitors at the same time. Excuse me a second while I push my eyeballs back into their sockets. Elsewhere, you get dual Gigabit Ethernet ports, 802.11ac wireless, five USB3 ports (one of which can charge other devices) and two USB2 ports, and there’s even an infrared port on the front in case you do in fact want to use the machine as a media streamer together with a remote. Fortunately, you can also opt for a plain metal and plastic enclosure if Intel’s garish neon red and blue skull (see image above) doesn’t quite take your fancy. In either case, you still get a three-year warranty and a VESA plate in the box for potentially mounting it to the back of your brand-new six-monitor setup. Intel’s NUC isn’t the only PC that will be utilizing its 8th Gen Core with Radeon RX Vega M graphics CPUs, as Dell and HP are also on track to release new lightweight 2-in-1s by the end of March. There’s no word yet on what they look like or how much they’ll cost, but with Intel saying the chip should allow for devices measuring less than 17mm thick, we could be looking at some seriously slim bits of kit. To give you an idea of what kind of gaming performance you can expect, Intel claims its Core i7-8705G with RX Vega M GL graphics (remember, that’s the lesser of the two chips launching today) will be able to produce an average frame rate of 47fps in Vermintide 2 at 1920×1080 on High settings. Compared with the 15fps Intel got from a three-year-old Core i7-4720HQ with an Nvidia GeForce GTX 950M chip under the same conditions, that’s one heck of an improvement. Intel also tested the the i7-8705G against an i7-8550U and 4GB GTX 1050 laptop system. In all cases, the i7-8705G won out, producing an average of 46fps in Hitman and 36fps in Deus Ex Mankind Divided – again at 1920×1080 on High. The i7-8550U, meanwhile, only managed 33fps in Hitman, 27fps in Mankind Divided and 42fps in Vermintide 2. The i7-8809G is even more impressive. In the same tests described above, it hit 62fps in Hitman and 49fps in Mankind Divided, according to Intel, which puts it just ahead of an i7-7700HQ and 6GB Nvidia GeForce GTX 1060 with Max-Q graphics system. Naturally, I’ll be putting both of these chips to the test as soon as review samples are available, but to see how Intel’s new CPU works in action, have a watch of the video below.